Part two of a Bon Jovi two parter! For the last instalment, 1984’s Bon Jovi, click here. Sophomore slump? Bon Jovi’s first record didn’t set the world alight, but their second, 7800° Fahrenheit sounded like they’d run out of material. It had a darker overall vibe, but managed to go gold in the US. To this day, 7800° Fahrenheit remains an inconsistent listen with a few great songs and a number of pure filler. Although I was backtracking through their catalogue after Slippery When Wet, I was decidedly disappointed with 7800° Fahrenheit. Based on the excellently fun single and video “In and Out of Love”, it wasn’t unreasonable to expect more. That song was a blast, quality-wise sounding like a Slippery also-ran. It’s the only tune that periodically shows up on Bon Jovi hits albums. 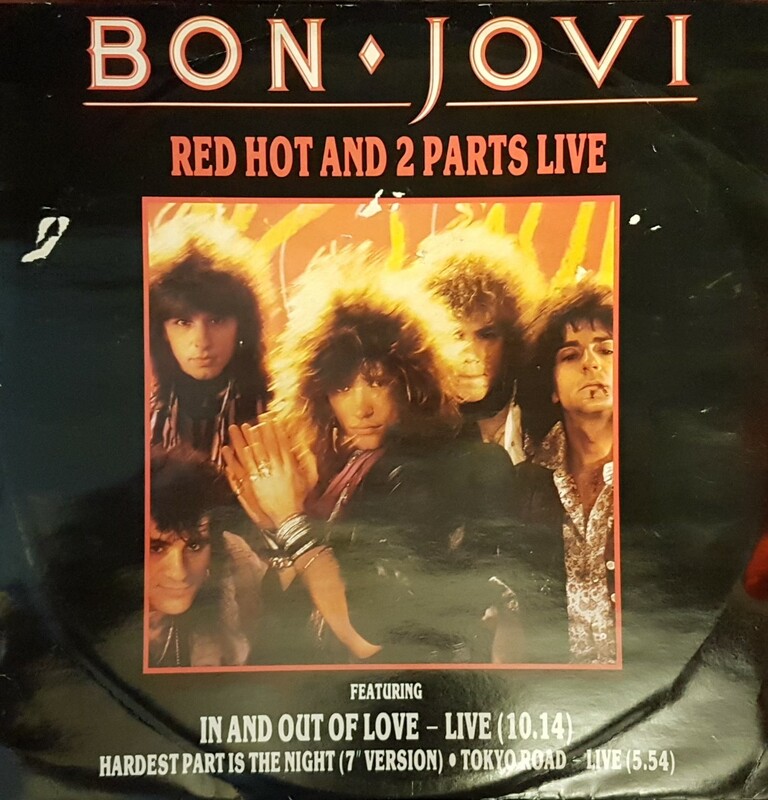 This remastered edition also has a smoking live version of the tune (from Tokyo), featuring an extended jam and guitar solo by Richie Sambora, before Tico Torres gets the spotlight for a drum solo! It’s a 12 minute track total, not the kind of thing you expect in a bonus track. Also on the better side are “The Price of Love” and “The Hardest Part is the Night”. Every good Bon Jovi has to contain a few heartbroken rockers. These two do the job while retaining an edge of toughness. Having Richie Sambora unfettered on axe sure does help. I’ll also admit a fondness for the single/video “Only Lonely”. Bon Jovi captured that tone of desperation. This rock ballad also appears as a live bonus track, much tougher and stronger than the studio version. It sounds like possibly a rehearsal tape. “Only Lonely” had a pretty high budget music video for a band of Bon Jovi’s stature. It’s cheesy as hell and absolutely hilarious to watch today. So serious! It almost appears like a trailer in some kind of Bon Jovi movie. I guess Jon was interested in acting even back then. 7800° Fahrenheit was also plagued with its fair share of filler, leading to believe that Bon Jovi really only had half the material needed for a good second album. Among the filler: “Silent Night”, one of the sappiest of the sappy ballads from early Bon Jovi. It does work in clinical studies* as a sleep aid, if you need that sort of thing. The last three albums tracks in a row were all pretty dozy and unremarkable, rendering the second side a limp finish. “Always Run to You”, “To the Fire”, and “Secret Dreams” as as forgettable as they are substandard. This second side has always made 7800° Fahrenheit a hard album to want to finish listening to in its entirety. The only interesting bit of trivia about these songs is that drummer Tico Torres only had one co-writing credit in Bon Jovi history, and it’s on “Secret Dreams”. I don’t need to tell you that whatever slump Bon Jovi were in, they certainly overcame it by the next album. With a little help of course: names such as Desmond Child, Bruce Fairbairn, and Bob Rock. 7800° Fahrenheit is a forgettable blip in their trajectory. * LeBrain HQ study sample group size: 1.